DESCRIPTION: How much more effective would your decision making be if you had data pointing to where the structural weaknesses reside? This macro level maturity model analysis searches for and identifies areas of weakness which are preventing optimum growth. This independent and unbiased examination arms you with the necessary data to move forward with confidence. This health diagnostic is similar to visiting a doctor for a physical. The examination will either affirm everything is healthy or identify potential problem areas, based on indicators obtained throughout the physical. These assessments cover very important areas such as methodology, systems, approach, strategy, market awareness, benchmarking, leadership, platforms, stakeholders, data visibility, collaboration and more as they relate to the module being examined. It is our recommendation to undergo this Organizational Health Diagnostic every 24 months due to the fast changing pace of today’s economy, leadership modifications, personnel adjustments, technology advances, procurement and supplier changes and other factors that can potentially alter the underlying structures of the organization and inhibit growth potential. PURPOSE: Our approach is different from the majority of consulting projects, where deep dive projects begin without key data pointing them to where structural weaknesses reside. The purpose of this preliminary analysis is to provide a high level diagnosis on where internal root weaknesses and problem drivers currently exist. Once armed with this critical data, a more focused and effective deep dive project can ensue. BENEFITS: With this macro level Organizational Health Diagnostic, your company will stop wasting time, money, and resources on projects where you don’t have the necessary data providing you direction and/or be alerted to existing unidentified vulnerabilities and weaknesses. Through this analysis, we will help you pinpoint the underlying structural challenges your organization is facing, which will enable more focused attention towards improvement and growth. Compliance, Contract Management, Culture, Departmental Capacity, Governance/ Policies, Internal Communications, KPI Management, Maverick Spend, People Management, Process Management, Rationalizing Demand, Skills & Time Utilization, Sourcing Management, Spend Analysis, Supplier Management, and Technology Management. WHAT TO EXPECT: The size of your organization will determine the amount of participants you should expect to engage in any module assessment. For instance, very small companies should have a minimum of 10 members of your executive and management teams, (consisting of the C-Suite, Finance Group, Operations, Procurement and H.R) other key personnel, and a sampling of non-managerial employees to take each individual module assessment. As the company gets larger, a larger data-set encompassing these representatives is necessary. The goal is to get a valid, statistical representative sample in regards to the total workforce. For larger organizations, we will work with you to identify the appropriate statistical representative number of participants to drive an accurate data set. Each individual module assessment contains a maximum of 60 multiple choice questions and can be completed in under 20 minutes. Our Management Consulting team will aggregate and analyze the assessment data and develop our diagnostic opinion of where internal root weaknesses and problem drivers reside. CONFIDENTIALITY: All participants’ responses are confidential and we only provide the data set averages, not the participants’ names or titles as part of our final reporting. This ensures confidentiality and the integrity of the assessment results. 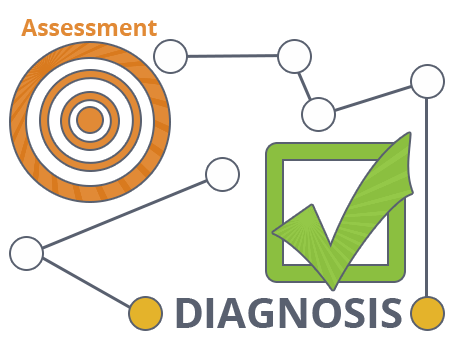 DELIVERABLE: You can expect to receive a PDF report that details the data set received from your team members’ assessment responses and our accompanying diagnostic opinion, in approximately 2-4 weeks from receipt of all completed team assessments. Expect a staggered turnaround time approach for multiple assessments for each client. Additionally, a 1 hour web conference with one of our consultants, to explain the results, will accompany the report. WHAT IS THE COST TO UNDERGO AN ORGANIZATIONAL HEALTH DIAGNOSTIC? Each individual module assessment and analysis fee ranges from $3,000 for small businesses and up to $8,000 for medium to large businesses. This price includes the administrative setup and management costs to run the online assessment and is based on a minimum average professional time of 20 hours to complete, deliver, and consult. Pricing is scaleable based on the size of the business and the increased time, attention, and resources required to drive the incremental value. Each individual Health Diagnostic Module is priced at a purchasing authority level enabling you to make an independent purchase, without the need for a group decision. There is no need to involve the group in decision making before you know where structural vulnerabilities and weaknesses exist. Your decision group will be better armed to decide where to allocate resources and time for a deeper dive project once you have access to this critical preliminary data and analysis opinion.